Speaking on a panel discussion on Tuesday about water in the universe, NASA’s chief scientist Ellen Stofan said she believes the first indications of alien life could come by 2025 — with more concrete evidence of extraterrestrial life coming in 20 to 30 years. 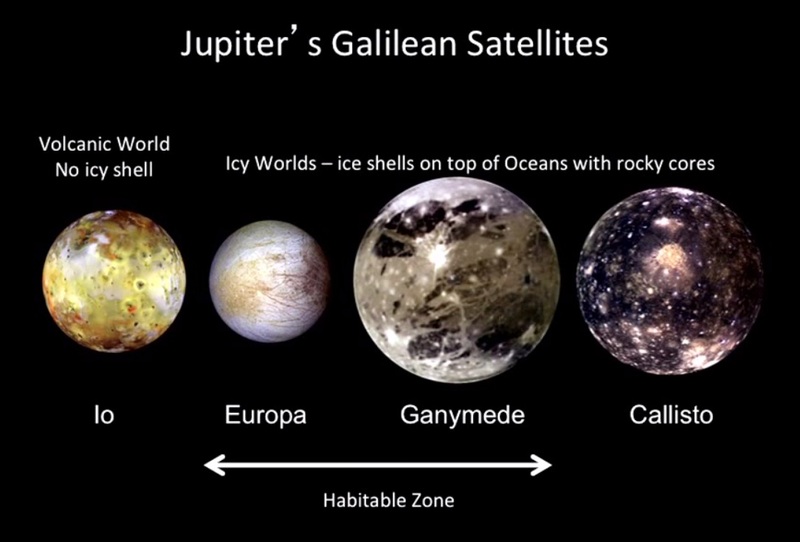 Scientists using NASA’s Hubble Space Telescope recently provided powerful evidence that Ganymede has a saltwater, sub-surface ocean, likely sandwiched between two layers of ice. Europa and Enceladus are thought to have an ocean of liquid water beneath their surface in contact with mineral-rich rock, and may have the three ingredients needed for life as we know it: liquid water, essential chemical elements for biological processes, and sources of energy that could be used by living things. NASA’s Cassini mission has revealed Enceladus as an active world of icy geysers. Recent research suggests it may have hydrothermal activity on its ocean floor, an environment potentially suitable for living organisms. On Mars, NASA spacecraft have found clear evidence that the Red Planet had water on its surface for long periods in the distant past. NASA’s Curiosity Mars Rover discovered an ancient streambed that existed amidst conditions favorable for life as we know it. More recently, NASA scientists using ground-based telescopes were able to estimate the amount of water Mars has lost over the eons. 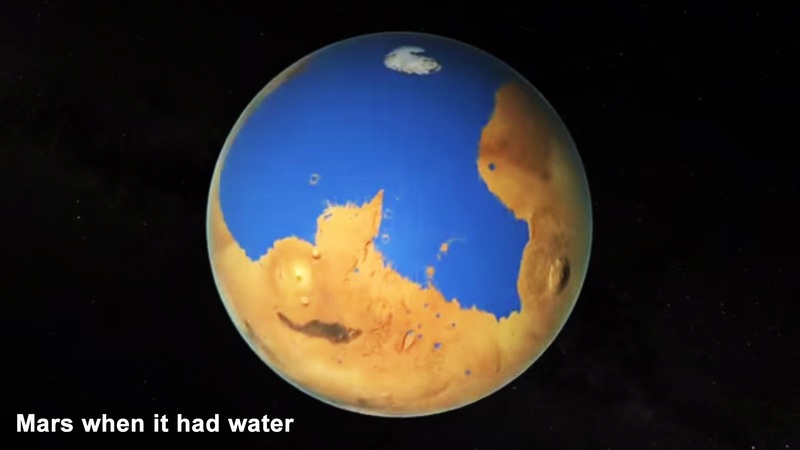 They concluded the planet once had enough liquid water to form an ocean occupying almost half of Mars’ northern hemisphere, in some regions reaching depths greater than a mile (1.6 kilometers). But where did the water go? It’s clear some of it is in the Martian polar ice caps and below the surface. We also think much of Mars’ early atmosphere was stripped away by the wind of charged particles that streams from the sun, causing the planet to dry out. NASA’s MAVEN mission is hard at work following this lead from its orbit around Mars. The story of how Mars dried out is intimately connected to how the Red Planet’s atmosphere interacts with the solar wind. Data from the agency’s solar missions — including STEREO, Solar Dynamics Observatory and the planned Solar Probe Plus — are vital to helping us better understand what happened. Understanding the distribution of water in our solar system tells us a great deal about how the planets, moons, comets and other bodies formed 4.5 billion years ago from the disk of gas and dust that surrounded our sun. The space closer to the sun was hotter and drier than the space farther from the sun, which was cold enough for water to condense. The dividing line, called the “frost line,” sat around Jupiter’s present-day orbit. Even today, this is the approximate distance from the sun at which the ice on most comets begins to melt and become “active.” Their brilliant spray releases water ice, vapor, dust and other chemicals, which are thought to form the bedrock of most worlds of the frigid outer solar system. Scientists think it was too hot in the solar system’s early days for water to condense into liquid or ice on the inner planets, so it had to be delivered — possibly by comets and water-bearing asteroids. NASA’s Dawn mission is currently studying Ceres, which is the largest body in the asteroid belt between Mars and Jupiter. Researchers think Ceres might have a water-rich composition similar to some of the bodies that brought water to the three rocky, inner planets, including Earth. The amount of water in the giant planet Jupiter holds a critical missing piece to the puzzle of our solar system’s formation. Jupiter was likely the first planet to form, and it contains most of the material that wasn’t incorporated into the sun. The leading theories about its formation rest on the amount of water the planet soaked up. To help solve this mystery, NASA’s Juno mission will measure this important quantity beginning in mid-2016. Looking further afield, observing other planetary systems as they form is like getting a glimpse of our own solar system’s baby pictures, and water is a big part of that story. For example, NASA’s Spitzer Space Telescope has observed signs of a hail of water-rich comets raining down on a young solar system, much like the bombardment planets in our solar system endured in their youth. With the study of exoplanets — planets that orbit other stars — we are closer than ever to finding out if other water-rich worlds like ours exist. In fact, our basic concept of what makes planets suitable for life is closely tied to water: Every star has a habitable zone, or a range of distances around it in which temperatures are neither too hot nor too cold for liquid water to exist. NASA’s planet-hunting Kepler mission was designed with this in mind. Kepler looks for planets in the habitable zone around many types of stars. Recently verifying its thousandth exoplanet, Kepler data confirm that the most common planet sizes are worlds just slightly larger than Earth. Astronomers think many of those worlds could be entirely covered by deep oceans. Kepler’s successor, K2, continues to watch for dips in starlight to uncover new worlds. The agency’s upcoming TESS mission will search nearby, bright stars in the solar neighborhood for Earth- and super-Earth-sized exoplanets. Some of the planets TESS discovers may have water, and NASA’s next great space observatory, the James Webb Space Telescope, will examine the atmospheres of those special worlds in great detail. It’s easy to forget that the story of Earth’s water, from gentle rains to raging rivers, is intimately connected to the larger story of our solar system and beyond. But our water came from somewhere — every world in our solar system got its water from the same shared source. So it’s worth considering that the next glass of water you drink could easily have been part of a comet, or an ocean moon, or a long-vanished sea on the surface of Mars. And note that the night sky may be full of exoplanets formed by similar processes to our home world, where gentle waves wash against the shores of alien seas. 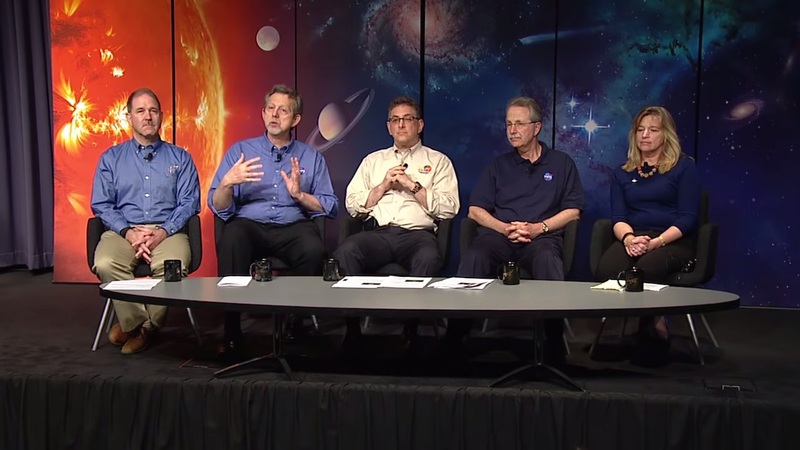 This panel discussion from NASA headquarters focuses on recent discoveries of water and organics in our solar system, the role our sun plays in water-loss in neighboring planets, and our search for habitable worlds among the stars. Earth isn’t the only ocean world in our solar system. Oceans could exist in diverse forms on moons and dwarf planets, offering clues in the quest to discover life beyond our home planet. Click image below to enlarge. Click your return arrow to return to this Dilemma X article.